“I just returned from competing in the 2018 NASA National Championships at Circuit of the Americas. For me, this was a dream come true! I suspect it would not have happened, however, without Motor Werks! I started in the track-car hobby six years ago with a bone stock 2006 Porsche Cayman S. Early on, I met Motor Werks Racing during a Chin Track Days event when I had a small problem with my car. They were super helpful! We took the car to their shop, and they sorted out the issue. That was the start of a six year relationship with Motor Werks. I absolutely loved the track day hobby, and wanted to grow in the sport. As my skills and competence increased (more than 50 events with Chin), Matthew Forte, would talk to me about changes to the car so that the car's ability and mine progressed at a similar pace. During four years of modifications, (cage, safety equipment, racing seat, wheels and tires, dampers, suspension, track set up, and too many changes to list here), my car became a full fledged race car. It has raced more than 30 races with NASA in the last two years. I can't say how much I appreciate Danielle's, Matthew's and their crew's efforts, advice, and expertise in helping me and the car progress. They have kept the car in excellent condition with post track inspections and regular maintenance work. Their workmanship and skill is superb!! Their track day support is wonderful! The way they run their shop makes you feel like family. 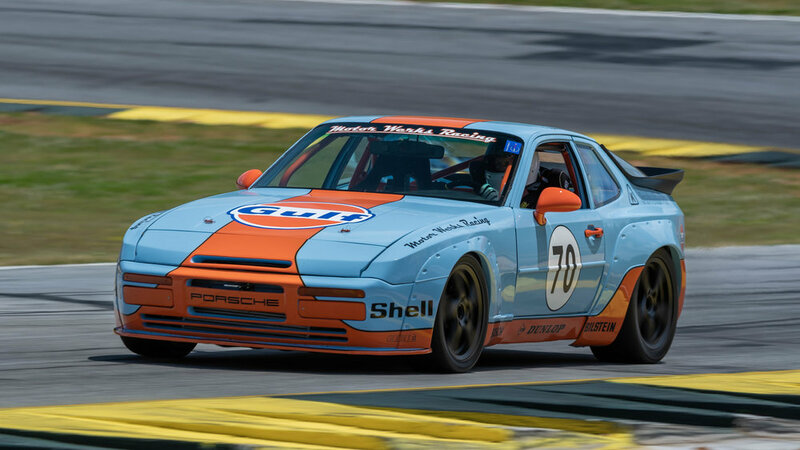 “I had been driving my Porsche 911 daily driver on the track for a little over a year when I realized that I was starting to get serious about the sport. I decided it was time to get into a purpose built track car so that I would have all the safety features such as a full roll cage, 5 point harness, fire suppression system, etc. Brakes and tires on the 911 were getting expensive so I was also looking for a solution that would be easier on the wallet! I met Danielle and Matt at Motor Werks Racing and fell in love with their cars. Matt is very passionate about his craft and pours a lot of love into each and every car the team builds. His team is top notch and everyone at Motor Werks Racing always puts the customer first. Through the build process, Danielle and Matt spent as much time as needed to help me make the right choices on the car and helped me understand why each decision was made along the way. Matt’s approach is very practical, building a car that can grow and change with the driver over time. He also did a great job helping me understand that some decisions can be made to save money without sacrificing performance, and some choices are made because we need to put safety first without any compromises. When the day finally came to get out on the track with my car, the Motor Werks team provided full track-side support. This is really needed since the difference between a new Porsche street car and a purpose built track car is like night and day. I was glad to have Matt and his team assisting me as I was getting acclimated to a new experience. The team always made me feel comfortable and stayed with me as I got assimilated to the car and my driving performance improved. I'm old school. I subscribe to the philosophy of why by a 4 cylinder when you can have a V8. Bigger is always better when it comes to an engine. So, three years ago I bought a new Ford Mustang GT 5.0. What a blast to drive around town. Love the car! Ford really got something right with that car. Then a friend of mine told me about a car driving event where I could take it on the track. I signed up, did an event. Boom...Hooked! Then a friend of mine offered me the best advice. He said "quit trying to turn a daily driver into a track car and buy something specific for the track". I did a ton of research. I looked at Miata's, BMW's, Old C5 Corvettes, kit cars, etc., etc, etc. before I finally decided on a track car. I just finished my second track day in a Porsche 944 built by Motor Werks Racing. If you search their site for the Castrol car, that beauty is mine. They took a 1984 944 and gutted it, added a role cage, sent it to paint, and then built a track car for me with aftermarket parts (some Porsche/some not) to specifications we both agreed to. The parts all work beautifully together and are inexpensive to maintain The team at MWR made sure of that. Today I confirmed I made the right choice. The car is so well balanced it is absolutely insane. Image driving a car that weighs less than 2100 lbs and handles like a go-cart. This thing sticks to the ground. I was grinning the entire time I was at the track. Crazier yet, it has a 4 cylinder. Yep, I bought a car with a 4 cylinder. I've never had a sports car with a 4 cylinder. The owner of the place (Matt) built the engine from scratch. It is a 1.8L Turbo and man that thing just rocks! It has well over 320 HP to the rear wheels and I only got the stage 1 turbo kit they offer, which was probably smart based on my skills, or lack of them. I can drive this car in 3rd or 4th gear exclusively and never run out of power, as the power band is so constant from about 3000 to 7000 RPM. It just pulls. I don't think I have even pushed it to half the power/speed it is capable of. This summer I'll have the opportunity to really learn to drive the car. I'll be in a safe, affordable, and FAST car thanks to Matt and the team at MWR. It should be a great season. Better yet, I will be passing a lot of those big boys on the track with those V8's. How do I know? Because today I took 5 seconds off my best lap ever in the Mustang GT at Atlanta Motor Sports Park and I wasn't close to pushing the limits of the car. Gotta go fast? You don't need a V8! I don't know of anybody who really likes that drink anyway, unless you stick vodka, Tabasco, and celery in it. I think I'll stick the the 1.8L Turbo from MWR. Then have a beer. Much more variety's to choose from, especially the German beers! I first became acquainted with Motor Werks Racing about five years ago when I joined Atlanta Motorsports Park and was driving a Cayman there as a street car. I was recommended to go and have a chat with MWR about possible improvements to my car to make the driving experience more pleasurable. I found MWR to be extremely knowledgeable and attentive to a driver’s individual needs. The crew listens to the customer desires and using their vast knowledge and experience will assist the driver in attaining his desires in a planned and appropriate path. In motorsports sadly one often overlooks the safety aspects in building a car, MWR is there to constantly remind you of the possible consequences of overlooking safety. MWR’s attention to detail is second to none. A car simply does not leave their shop until the work is completed to their standard. They have built two race cars, one track car and maintain my street car and I never take any of these cars anywhere without multitudes of compliments. I have found their work to be superior to that of the local Porsche dealerships and am constantly impressed with their knowledge of the Porsche marque. As someone that was new to motorsports and trying to figure out the best and most enjoyable way to get into it, I realized it can be very overwhelming with the amount of variables surrounding this sport. I was looking for a team that could not only provide me with a proper track ready car, but a team that could support me in all aspects that are involved with motorsports; be it mechanically, mentally or track-side. I came across Motor Werks Racing and they hit all of my needs and then some! My first visit to their shop was impressive to say the least. A shop that is that clean and a team that was immensely passionate about what they do is something you just don’t see these days. The team listened to what I wanted and provided me with feedback that made the most sense for what I sought to accomplish. I purchased a MWR turnkey car and even worked with them to put some personal touches on it. Since then I have spent time learning the car and tuning it to suite my needs with the help of MWR’s track support team and Matt & Danielle’s 17 years of experience. MWR gave me something much more than just a race shop. They have created something special, an experience that I’m proud to say I’m a part of. ~ Kevin N.
A few years back I attended a couple of days at the Porsche Driving School at Barber Motorsports Park. I enjoyed it immensely, was bitten by the motorsports bug, and knew I had to find a way to spend more time on the track. My problem was I didn’t have the skills, the tools, the space, or the time to maintain a track car. In looking for alternatives I stumbled across the guys at Motor Werks Racing. And I'm ever so glad that I did! Danielle, Matthew and the crew are true professionals. They built for me a base car, a lovely 924 GTS tribute. But that's just the start. They provide full support at the track, ongoing maintenance and development, storage and transport to the track. Without them I would not be able to enjoy such a great pastime. They're great people, too, and fun to spend time with at the track, as are their other clients. I could not be happier that I found them. I would absolutely recommend them to anyone who's looking for a way to get to the track and have a blast of a time. I’m very glad that a “Porsche” friend referred me to Motor Werks Racing. I’ve had work done on my 993 at dealers but I just wasn’t feeling confident about the service for which I was paying a premium. I sure have that confidence now. It’s like having a partner in the Porsche experience. The Motor Werks Racing team brings passion to their work. After talking with the team and getting service and custom work performed it’s clear that quality is an obsession at Motor Werks. Pure Porsche I would call it. And that is just what a Porsche owner searches for. I can assure that you will get expert technical recommendations, top-shelf service and good council. I have and will continue to be a client and recommend Motor Werks Racing to the Porsche community. "When I got into Porsche racing in 2003 I wanted to work with a shop that not only provided great service but their standards and attention to detail exceeded my own. Motor Werks Racing has been my first and only choice in developing & maintaining my 911. They took the time to learn my driving style and match that to my car’s setup, ultimately resulting in many wins and podium finishes in almost every racing event with NASA and PCA". I just wanted to let you know how pleased I am after having had a pre-purchase inspection performed on my 1996 Porsche 993 by your shop. The service I received from Matthew and staff was outstanding. I had many reservations about purchasing a fourteen year old Porsche after hearing and reading several horror stories from people who had bought similar cars that "looked" to be in pristine condition only to find out, after the fact, that they were stuck with multiple repairs costing into the thousands. Worse, I had also heard of people buying sight unseen AND having had a PPI performed, but the car arrived...shall we say...in less than accurately described condition by both the seller and the shop that performed their PPI. So, needless to say, I had my apprehensions. I searched the forums for recommendations on a trustworthy shop in or near Atlanta to inspect my car, essentially being my "eyes" since I did not want to book a flight to see the car until it had at least been properly examined and ok'd by a reputable professional. Motor Werks Racing came up as one of the shops in the area that was held in high regards. Deciding on Motor Werks as a potential shop to conduct the PPI, I then contacted your office and spoke with Jeff, who courteously provided me some information on the PPI, and who then put me in touch with Matthew who would be performing the inspection himself and who would be giving me more in-depth details as to what he would be doing to the car. I was truly impressed with how much information Matthew was able to share with me, and without rushing through it either. He patiently explained to me what I needed to know and answered every question I had for him in detail. This would be my first Porsche, and I laid a ton of questions on him. He answered every one of them, and did so in such a way that a novice like myself was able to understand. I felt very comfortable in my decision to have him perform the PPI on my soon to be 993. Matthew called me at intervals during the PPI to keep me informed of how the inspection was going, describing every detail he found regarding the car's condition inside and out. Overall, the car checked out wonderfully but there were some cosmetic imperfections that Matthew detected and he explained them to me so I knew what to look for. I expected to notice these things right away when I finally saw the car in person. I am extremely picky about such things, but when I saw the car myself, I could hardly notice these things that Matthew detected. My point in explaining this is that Matthew is even pickier than I am, and that's saying a lot about his dedication to giving his customer the most accurate description of the car. Honestly, I feel that my best interest was his top priority, and I went on to buy my car in total confidence that it was mechanically sound. So confident was I, that I decided to drive the 15 hours home to Texas. Needless to say, the car performed wonderfully. Everything was solid, from the clutch to the motor and everything in between. The only thing I could ask more of Motor Werks is that you please relocate to Texas so that I can continue my patronage. My best to all, and especially Matthew. Many thanks to you and the crew for the all the service and advice over the years. From the pre-purchase inspection, to the scheduled services, and the work in between, I sincerely appreciate your dedication to the cars and customers. Your shop sets the standard for customer care and quality of work. Best shop I have ever dealt with! Attention to EVERY detail. ~ Darren L.